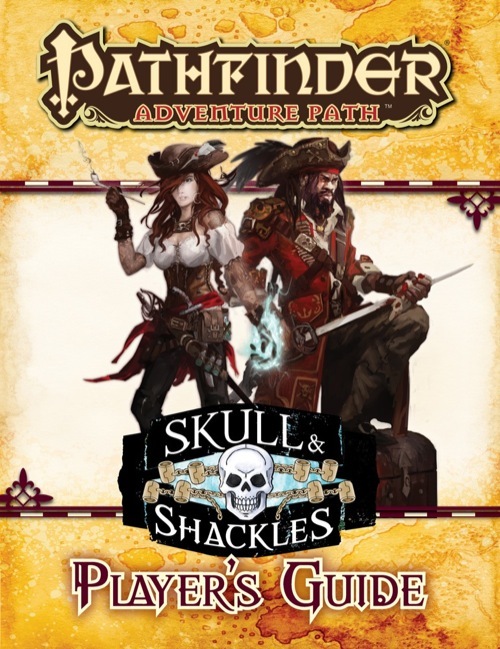 The Skull & Shackles Player’s Guide gives players all the spoiler-free information, inspiration, and new rules they’ll need to create characters prepared for the swashbuckling adventure and piratical perils of the Skull & Shackles Adventure Path. Within, players of this campaign will find everything they need to create character backgrounds tied to personalities and events vital to Pathfinder Adventure Path’s expedition onto the high seas, along with new campaign-specific traits to give bold adventurers the edge they’ll need to take on the varied and unpredictable dangers of the pirate isles known as the Shackles. New rules for ship-to-ship combat also give players the resources they'll need to sail pirate vessels, board enemy ships, and claim plunder as true scallywags. Adventurers don't need to take to the seas unprepared! Gather your allies, practice your best pirate voice, and let the Skull & Shackles Player's Guide set your course for the swashbuckling adventure of the Skull & Shackles Adventure Path. With 30+ years of sailing experience under my belt, I find this guide to be spot on! I think five pages of character-related content is thorough enough, without telling the players “This is the character you need to play in this campaign.” I love the scar and “peg leg” rules, and love that one of the character types is an amputee that has no debilitations from his lost limb, and a + on fortitude and a hatred and fear of sharks! The ship-to-ship combat section is longest, most detailed and, IMHO, necessary. The combat rules were previously sketchy, and would have been onerous to employ. Can you imagine figuring out damage for a 20 ballista broadside, plus archers with fire arrows? The idea to split the rules into “fleet actions” “ship to ship” and “shipboard” conflict is brilliant, and brings a real tactical element into play. I’m having images of the old “Star Fleet Battles” game already... I’m itching to see how the fleet action rules are different. As far as ship to ship combat is concerned, reading rules that regard opposed skill checks of pilots, including maneuvers such as “Shearing”, “In Irons”, “Dirty air”, “Wind gauge”, etc, lets me know that the game designers have done their homework. The effects of spells list is as comprehensive as I could wish for (and also vitally necessary), and I love the siege weapon section (Awesome that we now have different sizes of ballistae). Well done, lads and lasses… looking forward to playing this one! At 30 pages, this is the longest Player's Guide I've seen yet. The balance differs significantly from previous Player's Guides. Instead of being mostly advice about characters and how they link with the adventure path with a couple of extra rules thrown in, this is the opposite: there's a whole bunch of rules for ships and naval combat and the players get only a few pages. The usual breakdown of why particular classes or races may be in the area, or what connections they may have to the adventure path, is pretty much skipped. There are vague backgrounds mentioned in the mostly mediocre traits but otherwise this section appears rushed and incomplete. This will be a major shortcoming for those players who wish to define their characters in terms of life in The Shackles. Likewise there is no overarching goal implied to aid party unity which will be even more important in a Chaotic leaning Adventure Path. The rules for Naval Combat start simply, devolve, then end with over four pages about seige engines. The premise is good, the execution is standard and details are overly complicated. However, there is a highly useful page about spell effects at sea (though Fireball is listed under 'D' for Delayed Blast Fireball). There are also plenty of options and ideas for ships, with stats and modifiers for various types, and included are a ship character sheet and a page of ship counters. At about nine pages, this is a nice balance between complexity and options. Overall, this is not a Player's Guide but a bunch of extra rules that look like they didn't have the room to be crammed in the module. The first thing you'll notice is that, unlike Players' Guides for other adventure paths, there are no extensive writeups for each individual character race/class. In fact, this one manages to do that job in a few paragraphs. That leaves the remaining twenty-odd pages for the naval combat rules. At first glance, these appear solid, though of course we'll have to wait for a play session to give them a full test. Can't wait for the release of Wormwood Mutiny! My group has been looking forward to this AP and the PC just makes it more interesting. Ship to Ship combat looks to be interesting. Is anyone else having problems printing the Player's Guide? I can't get it to print, no matter what I do. Downloading this as soon as I get home from work. I am printing from Adobe Reader X (10.1.3) on a PC. After I send it to print, it goes thru the usual flattening process then I get a message box "The document could not be printed" and when you close that box, another pops up "There were no pages selected to print". I have tried print all, print single page, etc. and they all come back with those same two message boxes. Trying another Paizo pdf file - and everything works fine. I am stumped as to what is happening with this file. My problem is that it's taking forever. Carrion Crown, which was far more ink intensive, printed out far faster than this. It's pausing for about 2 minutes between pages. It's possible it might be related to Adobe X. I recall reading something about a printing bug with Adobe X back around the time I got my new laptop, which would have been Novemberish? I just updated Adobe a couple days ago. Had no problems printing off a couple other pdfs from Paizo. holy cow that's a ton of recommended skills and feats. In a standard 4 person party it's going to cost everyone to prep for this properly, hope everyone leaves some room on potential characters to account for this. Uninstalling Reader X and installing Reader 9.5 solved the printing problem for this file. This is the first file that would not print in Reader X for me - so I still think there is something different about this pdf file. Thanks for the advice Joana. I also had an issue printing with Reader X. I tried re-installing Reader X, repairing the program, and updating my printer driver, but still could not print. I did go back and print out several other pdf's I have downloaded from Paizo, but none of those had this problem. After a little bit more experimentation, I did isolate the issue down to the first page (cover). The rest of the pages would print without problem. I managed to print to the cover by selecting the Print=>Advanced=>Print As Image option. I too am having problems with printing the document (using Reader X v. 10.1.2). I've been trying to print only a few pages (3-7, then 8-30), but have been getting the same results as Lori B.
I would like to avoid having to un-install, re-install an earlier version, then un-install/re-install to the newer Reader again. Does anyone else have the same problem, and a suggested fix which doesn't require multiple un-/re-installs? Why are the ship stats presented here so wildly different than those in Ultimate Combat? I mean it's not just a little different, each ship type seems to have been completely overhauled. Will future printings of UC reflect these changes? Download Foxit. I had no problems printing when using their reader. Thank you for troubleshooting this! I hadn't noticed these posts until late last night, and we decided to use a completely new template for this product. I've heard of InDesign link errors causing this, but without being able to replicate it in the office, I've had no luck in determining what was causing the problem. I'll see what I can do and get this fixed as soon as possible. First, the UC vehicle rules were written to encompass any kind of vehicle, from a chariot to an airship. As a result, certain types of vehicles work better with those rules than others. Since we were building specific ship-to-ship combat rules for Skull & Shackles that didn't need to incorporate chariots or airships, we made changes to the rules to simplify them and make them work better for ships and only ships. Secondly, a number of changes result from changing ships from 5-foot-squares to 30-foot-squares. Using 5-foot-squares for ship combat would require a battle mat the size of an entire room, so to make the rules usable on the tabletop, we went with 30-foot-squares, which necessitated some changes in the ship stats. The changes in Skull & Shackles don't invalidate the rules in Ultimate Combat. If you're using a mix of vehicles, the rules in UC work fine. But if you're only using ships, I think you'll find the Skull & Shackles rules to be easier to use. Wil this be available in print as well? Nope. This is a free PDF product only. This should be fixed now. Something went all wonky with the display name. Problem solved with a simple update to v. 10.1.3. How difficult will it be to run Skull & Shackles with three (3) players? I was thinking about having them use 25 point buy as compensation. Is that going to work? I am preparing to run this AP, and I received an intiguing question from one of my players. "What alignments am I allowing?" The Player's Guide doesn't address this at all. Perhaps the campaign guide does? When one thinks of pirates, one usually associates them with an evil alignment. Of course they could be of most any other alignment, but I'd say the majority of pirates probably fall into the evil category. Because I'm not privy to what direction the AP will lead the characters and what sort of moral dilemmas they will encounter, I think I will play it safe and just disallow LE, CE, and LG alignments. I think it would not be a problem restricting the LE, CE, and LG alignments. I'd like to think of pirates (classical pirates, not the Somalian ones) as having a more chaotic lean than evil. That being said, a LN pirate captain would be appropriate, IMHO. As long as they follow an (mostly) honorable version of the pirate code, this alignment could still work. I've got to agree with Baron on this one. I could definitely see chaotic good pirates, and for sure chaotic neutral. Many classical pirates were actually empire builders, at least in the Caribbean. I don't know if I would like to run the path with a bunch of CE players, and I might frown a lot if one of them picked LG, but other than those two, I'd call it open season for alignments. Really looking forward to the path! Yay Pirates! As to piratical alignments; see TV tropes for the 'two types'. Or as per my first thought on learning of this AP: One Piece! The tavern is called the "Formidably Maid"? I had the same problem printing on X and it was the cover causing the issue. Just downloaded the PDF and am really excited by what I read; the battle scars/amputations and naval combat were of particular interest. However, I noticed when I tried to extract choice pages that there was a security password enabled. Is this now standard on Paizo PDFs or is this something unique to this PDF (or even perhaps my PDF)? Secondly, was the password suppose to be sent with the PDF and I'm simply missing something or was this a deliberate act by Paizo to inhibit what customers can do with their PDFs? Thanks you Paizo for the start of what will most likely be another great Adventure Path, and thank you all for any input you have with respect to my questions. One Piece was my thought too, upon learning I would have to re-engineer my PbP character. I'm making a Vanara Aquatic Druid with a similar history to Monkey (Ha!) D. Luffy; rescued by a benevolent pirate as a child, spent the rest of his life dreaming of following in that pirate's footsteps. The problem with that comes with choosing a campaign trait. Which do you think would best suit a Monkey D. Luffy sort of character? Or would it be best to homebrew one if that's the direction I want to go in? Barroom Talespinner: he grew up with tales of the sea and chose his path early on. Besmara's blessing: he is destined to be the Pirate King after all. Buccaneer's Blood: he's the son of Dragon, the world's most wanted rebel and grew up side by side with the son of Gol D Roger. Besmara's Blessing is what I was leaning towards, honestly. The character doesn't have any sort of famous (or infamous) pirate relations that he knows of. Barroom Talespinner may work well too, though. Will have to put some more thought into it to decide between those two. Since all APs are designed around a default baseline of 4 PCs, I wouldn't think it any different than other APs. I.e., you'll need to make some modifications, just as a GM would for a larger party. Epic point buy is going to amp PC power but it probably won't mitigate the need to modify. Higher stats won't change who can or can't cast spells, etc. It might, but your enemies have less targets so your players will get hit more. I'd say start them at level 2, and always try to keep them a level ahead of where they normally should be. The PDF has been updated to fix a printing issue that some customers have been reporting. I just downloaded the Players Guide again and tryed to print. Got the same thing. Would not print. All the ship combat information and the ship information makes this guide a very valuable resource. Is there any chance this information will also be a in a print release of some other sourcebook? If not, is there any chance of there being a print run of this Guide? I know I will be referring to it a lot. IIRC the ship stuff is in ultimate combat. But I may be wrong. That's actually a different set of rules--the rules in the PG are for a broader scale (30 feet instead of 5). There is always a chance that those rules will eventually wind up in some other book, but we have no current plans for that. I just bought the Adventure Path from my friendly local gaming store. Is it possible to download the Player's Guide without purchasing the PDF? The Player's Guide PDF is a free download. Just click on "Add to Cart." 1) On the ship stats (Hit points) it mentions: hp paragraph- First line (page 22) "The ships total hit points". Last line of same paragaph(page 22) "This line also lists the total hit points for the ship's oars and sails, if any". A Junk (Colossal ship) has 900hp (sails 360). Does it mean it has 540hp of hull and 360hp of sails (540+360 = 900)?? If so, then there are some mistakes. The Galley has 1560hp (oars 1400, sails 320). The math does not add up. Am I missing something? Or what does it mean? 2) If you do a Broadside attack and total damage is 100hp form 10 ballistae, you need to substract 50hp from hardness. Is this correct? 5hp (hardness) per ballista hitting different part of the ship? 3) On page 14, left colum, last paragraph, an example is given on how to deal with Broadside attacks. If 10 ballistae are used, and each deals 3d8 points of damage, can someone explain how come you the get 13.5 points of average damage? Would not be easier to roll damage once adn the multiply by 10? I need clarification. 4) I have looked through the CRB and UC with no luck in terms on how to assign BASE Save to ships. For the Shackles AP I want to create my won ships. Any guidance is appreciated. The ship's hit points are separate from the oar and sail hit points. A junk has 900 hit points, while its sails have 360 hit points. They are not added together. If you attack the ship, damage comes out of the 900 hp. If you attack the ship's sails, the damage is subtracted from the 360 hp. A broadside is considered a single, concentrated attack. You only make one attack roll, so a ship's hardness is only subtracted once from the broadside's damage (5 points). Average damage is calculated by taking the average of each die rolled, then multiplying that by the number of dice. A light ballista deals 3d8 points of damage. The average of 1d8 is 4.5 (1+8=9/2=4.5). Multiply this by the number of dice rolled (3) and you get 13.5 (4.5x3=13.5). Broadsides use average damage because a single attack roll is made for multiple weapons. The advantage is you only have to roll to hit once; the trade-off is that you only do average damage. To be honest, there's no set way to determine this. Ships (and other vehicles) are objects that don't behave like objects in a lot of ways. For example, nonmagical, unattended objects don't get saving throws, but ships do. For creating your own ships, I would compare them to the existing ship types in the Player's Guide. If the ship you're creating is closer to a sailing ship, give it base saves of +6. If it's closer to a galley, give it a +8. THANK YOU SO MUCH for clarifying!!!!!! Based on the amount of ship HP and armament, I am concerned that when engaged in ship-to-ship combat vessels will sink with relative ease. I did mock battles and after 10-15 rounds a ship went under. As a DM preparing to run the AP, I think this will take the fun away from PC's which is not my intention unless they want to sink every ship they see (or attempt). Yes, I know the Wormwood is a merchant vessel rather than a combat type. Also, I know is better to capture than sink ships but I wonder if someone has any comments or suggestions on how to possibly "aleviate" how ships get sunk.